Printing VDA labels by browser (PDF download)! For free! Please enter the informations to be printed into the fields. Fields that are not filled will not be considered in the printout. For the fields (11.1), (11.2) and (16) are different label variants available. If all the fields are filled, the first VDA data for printing VDA labels are preferred. The entry fields are already filled with test data for a sample VDA label. For printing VDA labels with own data, press the "Enter new VDA-data"! A small version of VDA 4902 label to be used to small load carriers is also available by the option in the bottom of the input form. VDA labels are mainly used by companies in the automotive industry or its suppliers. A VDA label is a standardized label with various information encoded in barcodes. 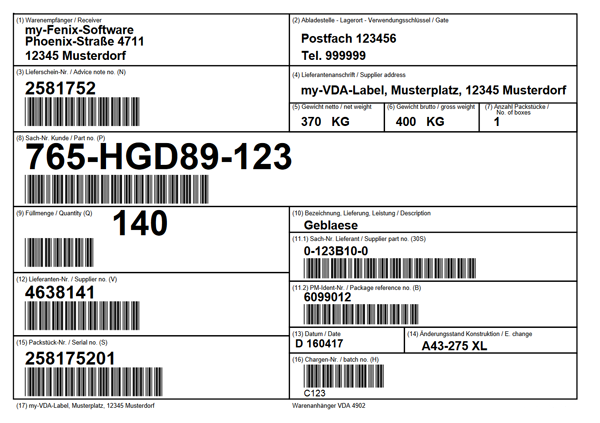 The VDA label contains all relevant information of a carrier and of its contained material in machine-readable form in different barcodes. The label, sometimes also called Odette label, uses the barcode code 39, has the size DIN A5 landscape format. It can be used as adhesive label or goods labels attached in a pocket on the carrier. In addition, there is a label variant for KLT containers that has only half of DIN A5 size. To identify the different barcodes of a VDA label, they are marked with identification letters. The letter P is the identifer for the part number of customers. If the scanner returns the value of P4711, the software detects automatically that it is the product with the number 4711. In dialogs, the software can enter all values automatically into input fields, so no data have to be entered manually. Automatic assignment instead of manual input avoids errors. The process is accelerated because all data is scanned instead of entered manually. Data are both in plain text and in machine-readable form always carried directly on the material. VDA labels have a standard format, they can be used by all companies involved in the value chain, and thereby simplify the interfaces between the companies involved.